Regular readers (and those who read the sidebar) will note that this is the week for a travel post, and last week should have been a food post. Ah, well. Vern and I have been kept very busy during recent weeks with our family elders. Between us, we are the nearest relatives to two mothers, one father, and one aunt, aged 78 to 96 years old, and all within a mile of us. Two of them moved into assisted living this week. Two of them have dementia, and two are legally blind from macular degeneration. One no longer knows who we are. So this week I’m sharing an image (Public Domain) from Wikimedia Commons of an old Italian postcard. 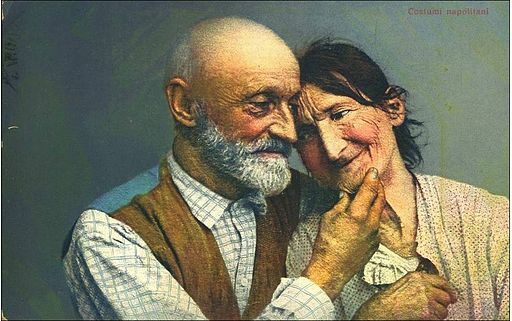 I hope Vern and I still have the tenderness in later years that this couple has! Vern’s parents have been married almost 70 years, and we will celebrate 37 years together on Valentine’s Day. Here’s to lovers of any age! I hope to be back to my blogging routine by the end of this month. This entry was posted in Uncategorized and tagged anziani, vintage postcard. Bookmark the permalink.